“Hey, Gitano!” It was sixth grade and I had been caught with my pants zipper down (literally). It was the eighties and yes, I was wearing Gitano jeans (anyone remember those?) For the next couple of days, I was known as “Gitano” until my classmates moved on to their next target. Oh, middle school! This happened over thirty years ago and now I use it as a story with the children in my practice to teach about shame, embarrassment, teasing and resiliency. It’s also an example of the negativity bias in action. In spite of many joyful middle school memories, this one moment of shame and hurt stands out in my memory. You may have experienced this with your child, so many positive things are happening, but they focus on the negative, they remember the one “bad” thing that occurred. They may even use it as evidence that nothing’s okay, that they’re not okay. If you want to try an experiment with your child, just ask them about their day and see what they tell you first… a celebration or a perceived mistake/problem? In short, your brain has specialized pathways that immediately transfer negative experiences into your long-term memory, so that you will learn from the event and remain safe. In contrast, positive experiences (unless they are very intense or novel) need to be held in short term memory for 5-20 seconds before being transferred into long-term memory. 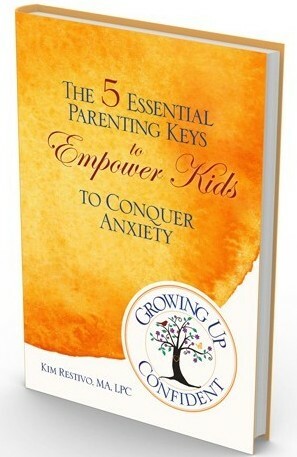 If your child has a tendency to dwell on the negative, there is no reason to worry. Their brain, everyone’s brain, is designed to make them more aware of negative events. Negative events stick in the memory more! How can you help your child focus on the good stuff? What can you do to help them overcome the negativity bias? Notice the Good Stuff– Ask your child what’s one good thing from today. I start most of my sessions with this question. Mindfulness of the good stuff is the first step toward anchoring it. Savor the Good Stuff– Help your child to tell their good stuff story. Use as many of the five senses as you can in the story to help anchor the feeling of joy in your child’s body. Anchor the Good Stuff– Help the good stuff sink in by guiding your child to feel the joy from the good stuff in their heart. Then ask them to place their hand over their heart and imagine the joyous feeling is a light inside radiating out from their heart until it fills their entire body. Hold for 5-20 seconds to anchor the feeling. Gratitude lists– Guide your child to tell, write or draw three things they are grateful for and why. What good stuff do you desire to anchor? I’d love to read your answers in the comments below. You are a star! I was at my wits end with my daughter and you are a blessing for sure, I am so appreciative of your help. Thank you!